Lady Margaret Hall was founded in 1878 to allow women to study in Oxford. In the early days, our students weren't permitted to visit the Bodleian, and as a result our college library was particularly important. Our library collection grew thanks to a number of donations, of books for general student use as well as of rare and antiquarian books. 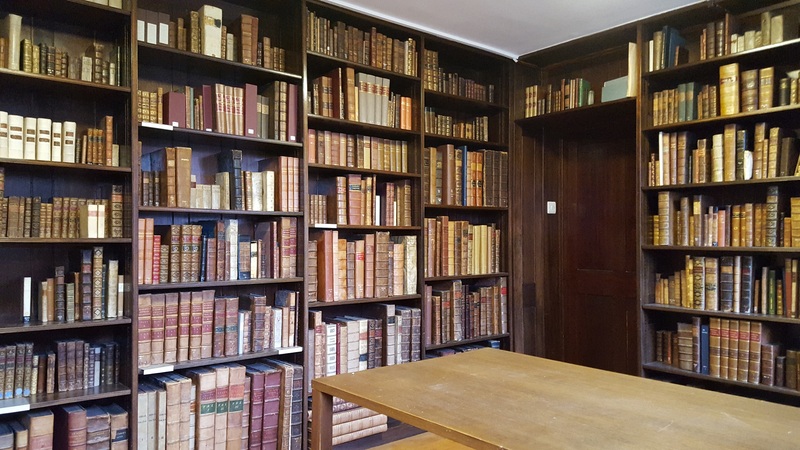 Compared to most of the former men’s colleges of Oxford, our rare books collection is small (around 2,000 books and pamphlets), but it is an individual and fascinating one, owing much of its character to a comparatively small number of significant donors over the years. Our collection is entirely catalogued on-line on to the Oxford catalogue, SOLO. Our major antiquarian book collections are in the fields of classics, modern languages, and 16th- and 17th-century works: literary, historical, religious. We also have a very good collection of children’s books; and a superb collection of examples from many of the major private presses of the late nineteenth and early twentieth centuries. We welcome visitors wishing to consult our special collections, who should first make an appointment with the Librarian. In addition to the books held by LMH Library, our Western manuscripts are on deposit in the Bodleian. Official records of the College and personal papers are held by LMH Archives. The early days saw many gifts from supporters of women’s education, and the early going down students often gave a gift of books to the library. Three famous early donors were John Ruskin, "Lewis Carroll" (the Rev. Charles Dodgson, Fellow of Christ Church) and Jane Morris. Ruskin’s gift came after his visit to the College in 1884, and the three beautiful Kelmscott Press books given by Mrs Morris remain a highlight of the library’s collections. 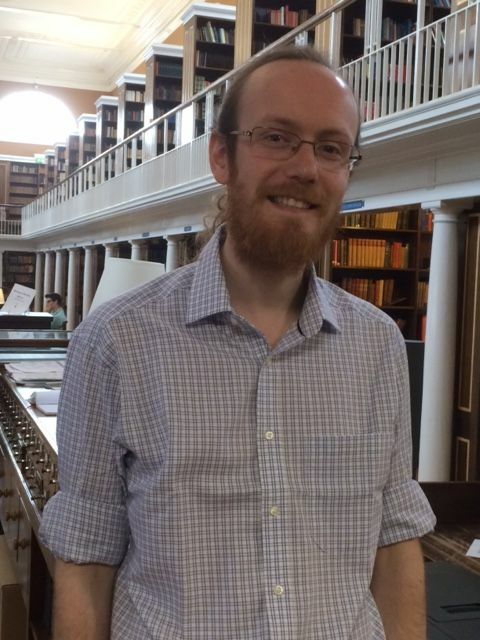 Charles Dodgson gave copies of two of his mathematical works to the library. In Edith Langridge's (LMH 1885-88) reminiscences for the Brown Book of 1948 she tells how he tested The Game of Logic before publication by playing it (on successive Thursdays after dinner) with LMH students of her year, so it is appropriate that he donated a copy to us. We also have a first edition of Alice’s Adventures in Wonderland (the first published edition, not the mythically rare first recalled edition!) which has come to us via an early student. The bookplates of early Fellows, Eleanor Lodge, the Deneke sisters and Mary Coate, (amongst others), occur across our special collections, and also across the main collection, serving as reminders of early days at LMH and the dedication of the early Fellows. History and Modern languages are particular beneficiaries in this respect. As is only right for a college founded to further the cause of female education, we have an interesting collection of books relating to women’s rights, suffrage, and education, and have continued to maintain strong sections on women in the library. These sections include the works of Simone de Beauvoir, Elaine Showalter, Helene Cixous, Toril Moi, Luce Irigaray, and Judith Butler, and also those of distinguished former LMH students, Marina Warner (LMH 1964-67) and Mary Jacobus (LMH 1962-65, Fellow 1971-80). Amongst our early treasures, we have the first Irish edition of Mary Wollstonecraft’s A Vindication of the Rights of Woman, donated by Edith Bulbring (LMH Fellow 1960-1976) and the first edition of Godwin’s memoir of Mary, published in 1798. Recently catalogued is a collection of rare pamphlets on the women’s degree question in Oxford. We also have a set of The Fritillary (a magazine issued jointly by the women’s colleges), and The Barnacle (a magazine written by women seeking to educate themselves before the women's colleges were founded), and indeed a set of our own Daisy, an early LMH publication filled with interesting glimpses of the college's history. And of course, we have the numerous published works of early students and Fellows, in addition to their generously donated books. The many bays in the Library bearing their names are a tribute to them. In 2011 the Institute of Gender Studies was affiliated to LMH, and we now house and make available their small specialist library, thus further enhancing our excellent collection of books in this field. We have not one, but two very beautiful Venetian missals of the 16th century. One is the gift of Edward Wilde, the other Kathleen Chesney. Both are printed in black and red throughout, with music, and exquisitely illustrated with woodcuts and decorated initials. We have several interesting copies of the Bible, one of them being an edition of the Vulgate translation published in Lyons in 1566. Also noteworthy are our Geneva Bible of 1608 in black letter type, published by the King’s Printer, Robert Barker; a Barker Book of Common Prayer (1614); a Baskerville Holy Bible (1772); and a Baskett Book of Common Prayer (1751). Our small but very interesting collection of early books on witchcraft includes the notorious Malleus Maleficarum, Bodin's Demonomanie des Sorciers, and Glanvill's Saducismus Triumphatus. We were also, by happy chance, given a private press edition of Reginald Scot's Discoverie of Witchcraft, first published in 1584, which refutes the extreme ideas on witchcraft promoted in our other books. 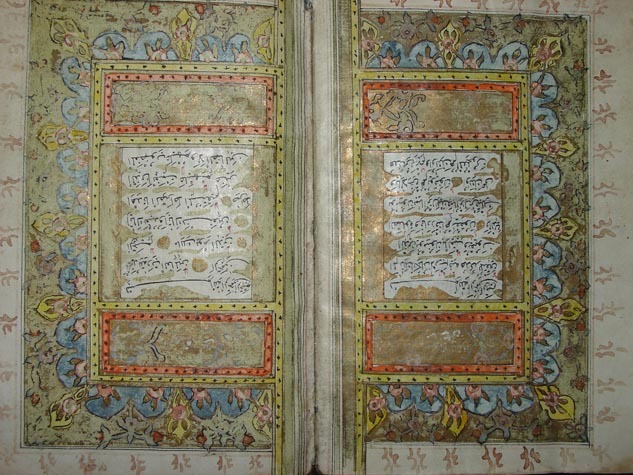 LMH has a very beautiful manuscript copy of the Holy Qur'an, created circa 1600 and donated by Lynda Grier (Principal 1921-45). LMH has a good collection of antiquarian books relating to law. We have a set of Statutes at Large, from the Magna Charta to 1761, in 8 volumes (1769), two 18th-century Collections of State-tryals and Proceedings upon Impeachments for High Treason and other Crimes and Misdemeanours (1719 and 1730), and a small run of Blackstone’s Commentaries dating from 1787. There is a small and fascinating collection from the 17th century; the most interesting possibly being Fuller’s Soveraigns Prerogative and the Subjects Priviledge (1658). This was donated in 1918 by the Warden of Wadham, Joseph Wells, an early member of Council and also generous friend to the Library. From the 18th century interesting publications include The Compleat Parish-Officer, an early handbook on local government and the duties of the constabulary (5th edition, 1729, Katherine Briggs’ bequest), and two books on the Exchequer: Fitzneale (1758) and Madox (1769). Foremost amongst our scientific book collection are Newton’s Principia, and four early works by Robert Boyle. We also have a Latin translation of Galileo's Dialogo from 1663. The Boyle and Galileo were donated by Edward Wilde and the Newton by Alex Whitson. Included in our natural history section are the extensively illustrated Topsell’s bestiary, History of foure-footed Beastes (1607; another Katharine Briggs gift), and various other beautiful books of natural history, including Linnaeus’s Flora Lapponica (1792). Scandinavia is further represented in our magnificent 6 volume set of Oeder’s Flora Danica (1766), donated by Ruskin, in addition to copies of his own works. We also have a charming representative of a later period: Harrison’s Floricultural cabinet and florists’ magazine (1841-6), an early gardening periodical. Note too should be taken of an early medical work: The Diseases of Women with Child, and in Child-bed, a translation from the French of F. Mauriceau (1752), donated by Mrs Terroni. For final mention, we have two books on the domestic arts, including cookery: The Young Ladies School of Arts, by H. Robertson (4th ed. 1777) and the even earlier Closet of Sir Kenelme Digbie (1669), donated by Cynthia Borough. We have a superb collection of English literature, with examples of works published across the centuries. Our dictionary collection is particularly good. We not only have the second and fourth editions of Dr. Johnson’s dictionary, but also the Henry Cockeram dictionary of 1637, which is rarely to be found elsewhere (part of the Katharine Briggs' bequest). From the 17th century, we have a 1640 edition of Donne’s LXXX Sermons, and a second edition of his work on suicide, Biathanatos. We have a handsome 1617 edition of Spenser’s works with woodcut engravings, which may be contrasted with an early almanac, crudely printed circa 1740, entitled The Shepherd’s Kalender. We have fine collections from the 18th century, including handsome sets of Dryden and Pope; and among our extensive collection of late-19th-century works are many complete sets, including the works of our first Principal, Elizabeth Wordsworth, and her friend, the author Charlotte Yonge, which include a rare copy each of The Castle Builders and Abbeychurch. An example from the early 19th century is our first edition of Mansfield Park. Starting with our Jane Morris gift from the Kelmscott Press, LMH has been very fortunate in its private press books acquired by bequest and donation. There have been two major collectors (Cynthia Borough and Edward Hugh Norris Wilde) who have given or left their books to LMH (as well as some superb individual gifts). As a result, we have a collection which contains significant examples from all the major presses, from the late nineteenth century, through into the heyday of the private press in the earlier part of the twentieth. Included amongst our collection are works printed by the following presses: Kelmscott, Ashendene, Essex House, Chiswick, Gregynog, Golden Cockerell, Doves and Nonesuch. 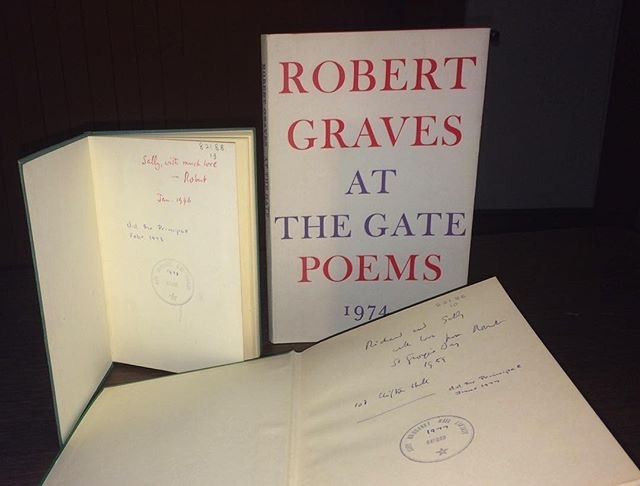 We also have signed first editions of Robert Graves and Stevie Smith, donated by Sally Chilver (Principal 1971-79). Another book worth mentioning in this context is a copy of the first edition of Tennyson’s Enoch Arden, containing a letter written by Tennyson to Lynda Grier’s grandfather, the Rev. Allen. Our French collection is superlative, both on the open shelves, and held in the Briggs Room and elsewhere. This is in part due to donations from Suzette Taylor (LMH 1884-86), a great traveller, who also left money for the Suzette Taylor travelling scholarship,and whose collection of about 800 books in French, Spanish and Catalan reflects her book-buying during the course of these travels; and Kathleen Chesney (LMH 1918-22; later a fellow at St. Hilda’s). Subsequent donors include: Vivienne Mylne (LMH 1945-48); Joan Crow (LMH 1938-41 & F.1947-84); and most recently Betty Tupling (LMH 1936-39), who has donated a beautiful small set of Fenelon’s Telemaque published in 1796. Particularly significant is our copy of the first edition of the famous Diderot Encyclopedie, a magnificent set comprising 17 volumes of text and 11 volumes of plates, published in Paris between 1751 and 1772, and given by Helena Deneke (LMH Fellow 1913-38). We have wonderful multi-volume sets of many 17th- and 18th-century authors, as well as seven rare 16th-century French publications. The other languages studied at LMH are well represented too (German, Spanish, Russian and Italian) and LMH has a particularly excellent Dante collection. Its foundation was a large bequest from Lucy Ethel Willock in 1919, and from George Musgrave, the most notable part of whose donation was a set of the plates of the original drawings done by John Batten for Musgrave’s edition of the Inferno. In addition to old and beautiful editions of Dante (the earliest being two fine 16th-century Venetian publications) and works about Dante (including a fascinating early study of the Inferno dated 1544), our collection of illustrated Dante has continued to grow over the years. One recent acquisition is a modern German translation illustrated by Monika Beisner, donated by her in 2001 after an exhibition at the College of her miniatures depicting scenes from The Divine Comedy. Our Greek and Latin collections are excellent, and this is in particular thanks to Edward Hugh Norris Wilde and his wife, Agnes Clay, who taught classics at LMH (LMH 1886-89, Fellow 1901-10), before she married. They donated many very fine editions of classics texts over many years (and, in addition, many other rare and interesting books, notably one of our superb illustrated missals, and many beautiful art books). Our one incunable was donated by Edward Wilde (The Opuscula of Gregorius Tifernas, Venice 1498), as were most of our collection of the Aldine Press books. We have 17 of these, and they are amongst our oldest books; in addition we have good 17th and 18th century editions of these texts. A recent bequest from Majorie Ridley (LMH 1944-47) contained two superb fine press books illustrated by Aristide Maillol: a limited edition copy of Virgil’s Eclogues (1927); and a beautiful edition of Longus’ Daphnis and Chloe (1937). The collection left to us by Katharine Briggs mainly contained books published in the 17th century, and in particular relating to the English Civil War; thus we have an excellent collection of the political writings of the time, including an extensive collection of pamphlets, some of which are very rare. The breadth of her bequest to LMH can be seen from books referred to elsewhere in this article, spanning religious writings, literature, travel, and topography. A set of illustrated children’s books was given to us by Cynthia Borough (LMH 1919-22), and has been added to by further donations over the years, particularly noteworthy being those given by the Deneke sisters. The collection spans the history of book production for the young, with interesting examples from all periods. We have a collection of booklets published between 1799 and the early part of the nineteenth century, and many beautiful illustrated books from the early part of the 20th century, including Caldecott picture books, and illustrated books by Walter Crane, Kate Greenaway, and Arthur Rackham. A highlight of the collection is our autographed copy (the 1866 edition) of Lewis Carroll’s Alice’s Adventures in Wonderland, inscribed by Carroll to Edith Jebb (one of his child friends, and the aunt of Cynthia Borough). LMH also possesses Carroll’s The Game of Logic which he donated to the College in 1887, the year of its publication. LMH Special Collections are open to visitors by appointment during staffed hours, Monday to Friday, 9 a.m. to 12:30 p.m. and 2 p.m. to 5 p.m. Researchers may take digital photographs of our printed collections for personal study. If researchers want professional photographs of any of the College's printed books, they must email the Librarian who will discuss the options of photographers they can commission. Permission to reproduce images from the College's manuscripts or printed books must be obtained from the Librarian in advance of any publication, but is not normally withheld. We reserve the right to charge a reproduction fee, and to ask for a copy of any book the image features in. Please email with details of the image to be reproduced. Copyright in the reproduced image remains with Lady Margaret Hall, and the image must be credited "By kind permission of the Principal and Fellows’ of Lady Margaret Hall, Oxford". In 1984 the most precious of the books were gathered together and removed from the main Library and placed in the Briggs Room. This is named after the writer on folklore Katharine Briggs (LMH 1918-22), who had recently bequeathed to the College her collection of antiquarian books, mostly dating from the 17th century. The Briggs Room is now too small to contain all of LMH’s treasures, and some of them are located in the Joyce and Lawrence Lacerte Rare Books Room in the new Law Library extension on the ground floor.